Like the all-new Mazda 6 we showed you this morning? 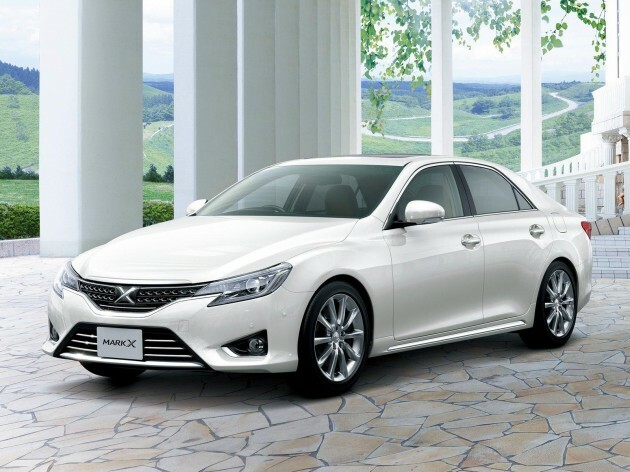 Here’s more sedan from Japan, this time the facelifted second-gen Toyota Mark X for 2013. Our urban readers might be familiar with the older version of the Mark X, a JDM sedan shipped in by grey importers. The larger, second-gen Mark X – introduced late 2009 in Japan – is less common here. The facelift gives the Mark X an aggressive front end with a chain-style grille featuring the trademark big ‘X’. In fact, the face itself has the X-shape now, with sharp headlights completing the new mask. There are new design tail lamps at the back. Not fierce enough? Check out the version by Toyota G Sports in the gallery. Two engines are available for Japanese buyers. A 2.5 litre V6 produces 203 PS and 243 Nm of torque, while the top model gets a 3.5L V6 with 318 PS and 380 Nm. Both naturally aspirated engines are mated to a six-speed automatic transmission. Power goes to the rear wheels, as it has always been, but one can opt for AWD. A gallery, including pics of the cabin, is after the jump. So ignorant huh. Sir, the Sonata is a front wheeler, the Mark X is a rear wheeler. Totally different car, totally different driving experience. Mind you this car is a sports sedan compared to a Sonata, a family sedan. Jangan la compare apples to oranges. This car in Japan competes with C-class, and 3-series. Albeit this guy’s more value for money compared to Germans. hyundai just overestimated their brand’s value. they should give more spec to thier car, to compete with other jap car, like what Kia doing now. I’ve heard of people saying the 2nd gen Mark X looks like a Hyundai Sonata.Those people need to pluck out their eyes and what it with clorox. And now this facelift makes the 2nd gen Mark X even sportier!! if they can emulate german engineering and be better, then why not? I agree that it totally doesn’t look like a Hyundai, it looks uglier than a Hyundai. 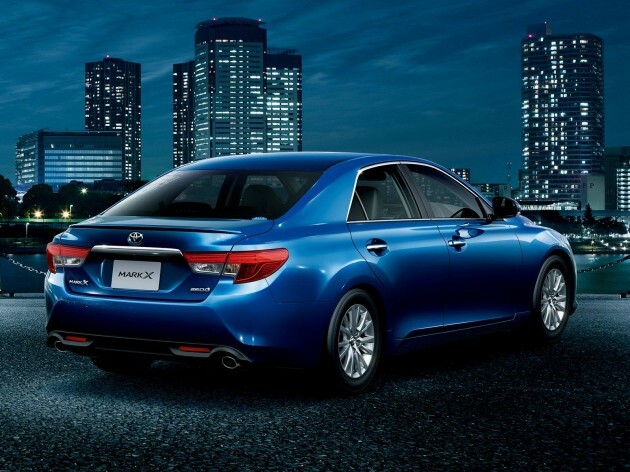 Nice…very nice on the exterior…interior could have been better but we won’t be getting this model from UMW Toyota. Yes, why Mark X cannot be Mazda 6-ish? Toyo designers are sleeping all the time? Much better than the first gen.
Looks bad, wonder what the designers thinking. I just wonder what you thinking. Mark X is bad, new Camry is worse. This is so much better from Toyota. How come Camry can’t have similar DNA style? It is so ugly. Worse than the Camry. What were they thinking. It looks like one of the monster in Ultraman. actually this car is in which category ya? C-segment or D? or it sits in between C and D? or even in between D and E? It’s a D-segment car.Same class with the Camry/Aurion.But it’s targeted towards younger buyers.And it’s more similar to the Lexus IS than the Camry,actually.In a way,it’s something in between of the Camry and Lexus IS. This one make Sonata and Optima like from Jurassic Park. Well, that’s because it’s from the stoneage. Funny that I contradict myself now. Toyota Camry should at least look like this if not better. Seems like the Japanese are finish recovering from the tsunami, nuclear meltdown in Japan and flood in Thailand. Give them allowance for another 1 year to give us an awesome looking car. Look out Koreans! What crap is this? Mark X suppose to be an elegant car. But with such design, it’s total disaster. The Mazda 6 is love at first sight, this one needs a little proding to ignite the sparks. Hold on, this car is to be launched in 2013… impossible that you already saw it on the road. How much u think dis MX2 will cost??? Looking at the photo, the inside seems to have a clean look but boring, the luxurious feeling is missing. The exterior front reminds me of a samurai helmet, very japanese. I can live with the back design though. 2.5 litre seems powerful enough. But what really make you not wanting this car is probably a the price tag which won’t be cheaper than a camry, would it? If so, this car is not for me as can’t figure out why should I want this car over another model for similar money. unique in its own design on ex/interial, more than sufficient power for its size, however i am more impressed with its quiet v6 engine on previous model besides is250. this is a great car to consider. anyway, choice is yours. no harm to have a healthy competition among car manufacturers. Great-looking front, although the back has just got even more generic. The pre-facelift was more elegant looking. That said, niggles aside, this is what Toyota should be doing:- Looks good, drives well, especially with this Mark-X. better looks, better interior than the first and second gen x. luxury + sporty sedan. I know it looks better than H.Sonata… but Brand new MarkX is gonna be pricey. Sonata & Camry are still more affordable compare to MarkX. A midlife facelift looks like a complete replacement, toyota is surely very serious about this flagship model. I am a huge mark x fan, to be frank, was quite disappointed with the second generation initially,now it is much sexier! Can’t stop thinking of you! I have mark x, want to upgrand to this. An owner of both Mark X 2012 and Kia K5 here. This 2 babes are totally incomparable. For comfort driving, Mark X. Learn to appreciate before bad comments….how many of you really owned “a” car….not much just a car of your own, not a daddy’s car or mommy’s car or etc….then you are qualified to gives comments.